Dr Lustig's "Sugar, the Bitter Truth"
Gary Taubes: "Is Sugar Toxic?" Voakes and Bremer: "2-Number BMI"
BMI (body mass index) is a way to use your body measurements, to see if your weight is appropriate for your height. It is your weight divided by the square of your height, in metric units. There are calculator wheels and computer apps to help us find the number easily, but what does it mean? For adults, we have found that a BMI over 25 corresponds with poor metabolic function, and a higher risk of developing chronic diseases such as heart attacks and strokes (artery disease), diabetes and liver cirrhosis. The risk increases much more with a BMI over 30. In children it gets tricky! The body proportions in children are of course different from adults. This skews the BMI much lower. Under the age of 7, a normal BMI is 17 or less. Between age 7 and 15 the body proportions gradually change with growth to resemble adult proportions. During these years, the normal BMI is age + 10. After age 15, when age + 10 = 25, the normal BMI remains at the adult level of 25. A 12-year-old child (boy or girl) with a BMI of 23 would be considered overweight, because the upper normal BMI is age + 10 = 22. In order to express this in a convenient and understandable way, it is now recommended to record BMI with 2 numbers, like a blood pressure, with the second number being the upper normal, or age + 10. In this case, the child's BMI is 23/22 (say it as "23 over 22"). 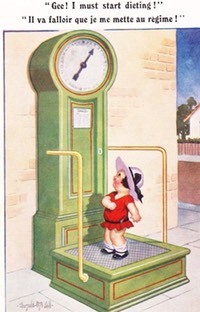 As another example, a 5-year-old girl with a raw BMI score of 15, would be normal, with a BMI of 15/17. The BMI is a remarkably simple and easily measured guage of the severity of metabolic dysfunction. The most remarkable property is that it can be used for early detection and prevention! Many studies have shown that BMI "tracks" into adulthood, and is able to predict a child's obesity and chronic disease risk later in life (unless interventions are made! ).